IHS/POLK Automotive Research will be attending the Advertising Committee call on Thursday 9/22. For Members ONLY: IHS/POLK Automotive Research will be attending the Advertising Committee call on Thursday 9/22. 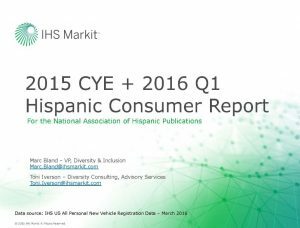 They will walk us through the Hispanic Automotive Report NAHP Commissioned on behalf of our members. Members should call in and get training from them on how to use the report. Remember that this report has been purchased by the NAHP for Member use only and to obtain a copy of this study, you MUST be a paid member of the NAHP and contact us directly at officemanager@nahp.org to request.